The Ekiti State Action Congress (AC) governorship candidate, Dr. Kayode Fayemi, today (Oct. 9) strongly refuted media reports that he has given up at the tribunal to allow Governor Segun Oni to continue as the Governor of the State having alleged rigging during the rerun poll in the State. Fayemi said such misleading and malicious media reports were being circulated by his detractors to cause confusion about his dogged stand against the massive rigging that took place in the State during the April 25 rerun election conducted in 63 wards across 10 local government areas of Ekiti State. A source confirmed that Fayemi, yesterday (Oct 8) told Justice Hamma Barka-led five-man panel that Governor Olusegun Oni of the Peoples Democratic Party (PDP) was wrongly declared winner of the rerun poll by the Independent National Electoral Commission (INEC). 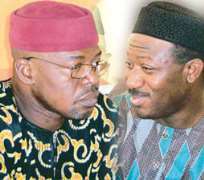 It further confirmed that it was a battle of wits between Fayemi and lawyers to the respondents. Fayemi was said to be in the witness box between 12.00 p.m. and 3.29 p.m., telling the jury that he had provided the tribunal with a "mountain-load of evidence" to demonstrate that election did not take place in any of the six wards in contention. The source revealed further that Fayemi reiterated that the Electoral Act 2006 was grossly violated in the conduct of the rerun poll ordered by the Court of Appeal, Ilorin Division, on February 17 in Ifaki I, Ifaki II, Usi, Orin/Ora, Ipoti A and Ipoti B Wards. Fayemi was led in evidence by his counsel, Anthony Adeniyi. He said it was curious that no party agent signed the official result sheets of the election conducted in Ido/Osi Local Government Area where Oni, the first respondent, hails from. The alleged intimidation of the Resident Electoral Commissioner (REC), Mrs. Olusola Ayoka Adebayo, by the agents of the Federal Government and the N250 million bribe scandal that rocked the election at Ido/Osi, also reverberated at the proceedings. However having debunked the erroneous reports in most national dailies about his purported withdrawal of his case at the tribunal, Fayemi in his reaction today expressed confidence that he has not lost hope in the judiciary. Still in his spirit of optimism, he said the tribunal would grant his prayers and dispense justice dispassionately by declaring him the duly elected Governor of Ekiti State, going by the arsenal of evidences he presented to them. The tribunal has adjourned hearing till October 19.